These cute Snowman Macarons take two almond flavored meringue cookies, that are shaped to look like snowmen, and sandwiches them together with a peppermint flavored Chocolate Ganache. I used a colored mixture of powdered sugar mixed with cream to make the Snowman's nose and scarf. What a perfect cookie for the holiday season. First, there is a detailed head note (here) with information on ingredients and technique that you may want to read if this is the first time you are making Macarons. But a note on making these Snowman Macarons. In order to get all the Snowmen the same size, I like to make a template. You may want to watch the video as I show you how to make it. Plus, the video is very helpful as it covers the ingredients and shows the technique for making these cookies. Once the cookies have been baked and cooled, they are sandwiched together with a peppermint flavored Chocolate Ganache. Ganache is simply a mixture of semi sweet or bittersweet chocolate and heavy whipping cream to which we add a little peppermint oil. In order to get that real authentic peppermint taste, I like to use peppermint oil, not peppermint extract. Peppermint Oil has a much stronger and more concentrated flavor than peppermint extract so only a small amount of the oil is needed to give the Ganache that cool and refreshing mint flavor. Unfortunately, peppermint oil is not found in grocery stores. You can sometimes find it in health food stores or it is available on Amazon. However, you can use pure peppermint extract, but you will need to use about 1/4 teaspoon of pure peppermint extract. 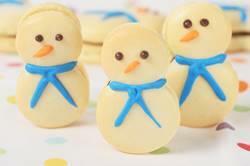 Snowman Macarons: Have ready two baking sheets lined with parchment paper. To make all the Snowmen the same size, I like to make a template. On a piece of parchment paper, draw 16 - 1 1/2 inch (3.5 cm) circles, spacing the circles about 2 inches (5 cm) apart. Then draw 16 - 1 inch (2.5 cm) circles on top of the bottom circles. (See video for demonstration.) Place the template under your parchment paper so you can use it as a guide. Place the ground almonds and confectioners sugar in your food processor and process until finely ground (about 1 minute). Sift the mixture to remove any lumps. In the bowl of your electric stand mixer, fitted with the whisk attachment (can use a hand mixer), beat the egg whites and cream of tartar, on medium low speed, just until soft peaks form. Gradually add the superfine white sugar, and continue to beat, on high speed, until the meringue holds a stiff peak (when you slowly raise the whisk the meringue is straight up, no drooping). Then, in three additions, fold the ground almond/sugar mixture into the meringue. When folding, cut through the meringue and then fold up and over, making sure to scrape the bottom and sides of the bowl. Once the almond mixture is completely folded into the meringue (the batter will fall back into the bowl in a thick ribbon) it is time to pipe the Macarons. Fill a large pastry bag, fitted with 1/2 inch (1.25 cm) (Wilton 1A) tip, with the batter. Pipe rounds onto the parchment paper, using the template as a guide. (See video for demonstration.) Then tap the baking sheet on the counter to break any air bubbles (can also break air bubbles with the end of a toothpick). Let the Macarons sit at room temperature for about 30 to 60 minutes (depending on the temperature and humidity of your kitchen) or until the tops of the Macarons are no longer tacky. Meanwhile, preheat your oven to 325 degree F (165 degree C). Bake the cookies (one sheet at a time) for about 14 - 16 minutes, rotating the pan front to back, about halfway through baking. The Macarons are done when you can just barely separate the cookies from the parchment paper. (If you find that the bottoms of the cookies brown too much, double sheet your baking pans.) Remove from oven and let the Macarons cool completely on the baking sheet placed on a wire rack. Chocolate Ganache: Place the chopped chocolate in a heatproof bowl. Set aside. Heat the cream and butter in a small saucepan over medium heat. (Can also heat the cream and butter in the microwave.) Bring just to a boil. Immediately pour the boiling cream over the chocolate, add the peppermint oil, and allow to stand, without stirring, for a few minutes. Then stir gently with a spoon or whisk until smooth. Cover and let stand at room temperature until thick enough to pipe. Place a little of the Ganache in a piping bag fitted with a small plain tip (I use a Wilton #3). Pipe two "eyes" on the small round of each Snowman. (See video for demonstration.) Put the rest of the Ganache in a piping bag fitted with small plain tip (I use a Wilton #12). (This will be used to sandwich the Macarons together. Frosting: In a small bowl, mix the confectioners sugar with enough cream so you have a thick frosting. Put about one third of the frosting in a small bowl and add the orange food coloring. Place in a piping bag fitted with a small plain tip (I used a Wilton #4). To the remaining frosting add the blue food coloring. Place in a piping bag fitted with a small plain tip (I use a Wilton #5). With the orange frosting pipe a "nose" on each Macaron. With the blue frosting pipe a "scarf" on each Macaron. (See video for demonstration.) Let dry completely at room temperature. Then use the remaining Ganache to sandwich two Macarons together. To assemble the Macarons, take two cookies (of equal size) and pipe Ganache on the flat side of one cookie. Top with the second cookie. While you can serve the Macarons the day they are made, these cookies are best when allowed to 'mature' for a day or two in the refrigerator. Can be stored for about 5 days in the refrigerator or they can be frozen for about one month. Serve at room temperature. Makes about 16 Snowman Macarons.